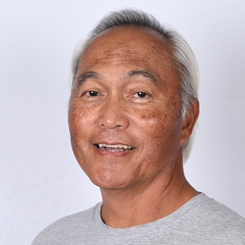 Vital started working at Gold Star as our parking lot attendant in the spring of 2015, but has been part of the GSG family since 2001, when his daughter CC implemented our Cheer & Dance program. He has a Bachelors from San Jose State in Industrial Arts and is now retired from his career as a design engineer. Vital is CPR and First Aid certified, and if you need to know how to tackle your siblings correctly … ask Vital, he has coached football for 34 years!